We just wrote a lengthy post on the importance of whey protein. This second guide will cover how to determine the best sources of poultry products: How to buy healthy chickens, eggs and everything in between. Buying healthy chicken and eggs can be quite the headache. Poultry products typically have some of the most wrongly marketed and deceiving labels of any animal products. When looking for animal based products, you want the diet of the animal to closely resemble what it would have eaten in the wild. Remember, you are what you eat, and whatever you eat ate! You’re not going to find much of a label on these items. This is the average $1 per dozen carton of eggs or run of the mill economy size package of chicken parts at your local grocery stores. You know all of those disgusting videos you see of sick animals crammed into large cages/warehouses being spraying with antibiotics and covered in each others feces? Their unused parts get chopped up and turned into some bizarre slime and fed back to the animals or to young children? Yes, that’s what you’re eating here. The animal’s living conditions matter not only in relation to what the animal ate, but also because stressed animals have higher levels of cortisol. This high stress environment and shift in hormones leads to higher percentage of chronic inflammation and omega-6 fatty acids, just as it does in humans. The low nutrient diet leads to meat and eggs that are also low nutrient. These are NOT healthy chickens. Steer clear if at all possible. This term actually has no formal regulation or definition. Essentially, cage free means that the animals are not confined in small cages smashed next to each other. This means they can still be (and likely are) in a gigantic warehouse smashed next to each other. Since this term is clearly misleading, several different groups are pushing for renaming this high density floor confinement. Again, NOT healthy chickens. Don’t worry about paying extra for anything cage-free. This term can be misleading as the United States Department of Agriculture defines free range as allowing animals short access to the outdoors- for a full five minutes per day. While this sounds like a luxurious lifestyle for the chickens, it usually means no more than a concrete slab with access through a tiny door. The whole point of being outside is so they can peck away at their natural diet of bugs and insects. Simply another marketing ploy to add $1/dozen eggs. Not really worth the increase in price for five minutes of play time, even though these are the most expensive eggs you will find at most commercial grocers. Laughter usually follows sight of labels claiming that their hens were never given any hormones. Because, well, US law tightly regulates and prohibits any hormone administration to poultry, so these manufacturers are simply abiding by the law. This label is like a water bottling company advertising no hormones in their new brand of water. Ridiculous and means nothing. Do not pay extra for this. Our hens were fed a diet rich with omega-3 fortified flax, grains, etc. Sounds fantastic, doesn’t it? Sure, until you realize that the chicken isn’t eating what it is supposed to be eating. Given there is also no regulation as to how much of the percentage of feed given to the chickens is actually fortified with omega-3, who knows if it is even a high enough concentration to trickle down to the consumer? If it says percentage of omega-3 diet on the label (some do) and it is fairly high, this is a better bet than CAFO, but still far from optimal. This would be otherwise fantastic, but a healthy chicken is not a vegetarians. They omnivorously eat insects, bugs, worms and other crawling things for a good portion of their nutrients. What this implies, however, as in the case of the omega-3 enriched diet, the chickens were intentionally fed something other than that they would naturally eat. This defeats the whole purpose of a proper and natural diet. Many times this 100% vegetarian feed is also nearly 100% GMO, and full of chemical fertilizers. On the positive side, some CAFO animals are known to be fed ground up feces and parts of other animals who have perished in the lot. So, not using that as feed is a plus. Organic eggs and chickens are not all that they are cracked up to be. This term only means one thing: The feed the chickens are given must be 100% organic, non-GMO, and free of any pesticides, herbicides or other chemical fertilizers. The chickens are still given feed though, which makes organic eggs and the meat potentially less nutritious compared to what a healthy chicken should be eating. The good news here is that there are a few hoops to jump through to get chickens and eggs labeled organic. This usually means that they are raised better, but more and more companies are catching on to marketing under the organic label, so they are just tossing a ton of “organic” feed into big pens. An outdoor play time is required, but there are no requirements on time (like the five minute free range) or accessibility. All of the chemicals and hormones collect in the chickens fat and concentrates over their lifetime, so this is one type of chicken/egg to spring for above normal choices. This is essentially what free range should mean. 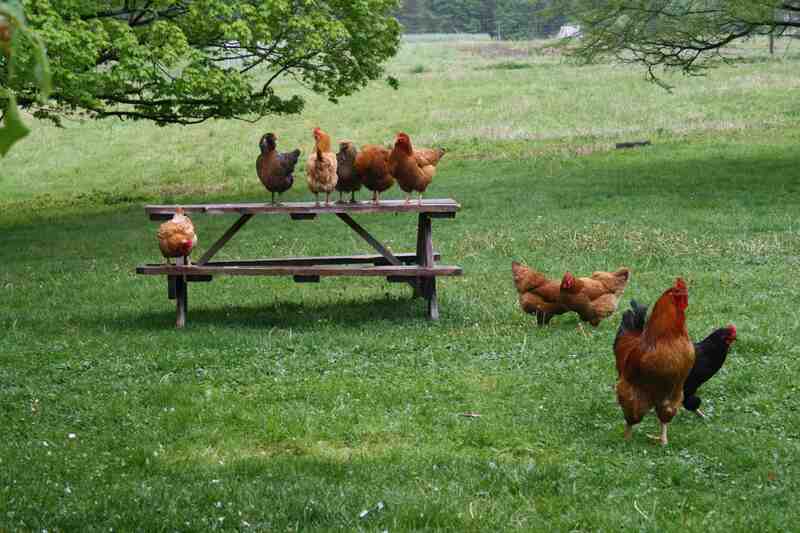 This is truly naturally raised healthy chicken on a farm, roaming around on grass, pecking away at bug and insects. When compared to commercially raised eggs, pastured eggs contain a much higher level of omega-3 fatty acids, lower level of inflammatory omega-6, 36% more vitamin A, 100% more vitamin E and 260% more beta carotene. These are often nearly impossible to get at large scale grocers, and even hard at places like Whole Foods. Your best bet is to find a local farmer and ask them how they raise their chickens. Chances are, the product will be more expensive, as is usually the case with quality food. It is not mass produced, therefore the price is where it should be. Just like that hand made furniture set of real wood is more expensive than the comparable set of press board at IKEA, you get what you pay for in terms of nutrition here. And this isn’t just your living room, this is your body and your health we are talking about here. Maybe forego a Starbucks run to compensate? Open the carton – if all of the eggs are all different shape, size and color, chances are you are getting them from a good source. Crack the egg – if the yolks are a deep yellow/orange and different color, this is a great sign of nutrient density in the yolks. The difference in shape, size and color across the spectrum is indicative of a varying diet of the animals, the way it should’ve been. Most of the harmful chemical fertilizer byproducts, inflammatory fats, and other negative ramifications from mass produced animals are concentrated as toxins in the fats. What does this mean for you? If you are buying chickens and eggs on a budget and only get CAFO animals, spring for the whitest and leanest meats and gravitate away from the fat and skin. These would not be a healthy chicken, but at least you are not eat all of the bad stuff. Don’t know where to start? EatWild, Local Harvest, and Eat Well Guide are all great places to find local sources of farmers selling animal products. Check out your local farmer’s market or use Google. If you really want to know where your animals came from, make your own chicken coop! Thanks for reading. If you have any questions or comments, please make sure to join in on the conversation below!